The Blog of Thog: Adventures in Norfolk - Post Three! So, last time I asked the question, what does the word "Quaggled" mean? It took us about half an hour to drag an answer out of Dusty's mum, but apparently it means wrinkled, as in how your toes might become wrinkled if you stay in the bath for too long. You learn something new every day. On the Saturday evening we had a barbecue, which included ghost chilli burgers from Tony Perkins butchers in Dereham. Ghost chilli's are, for those not in the know, ridiculously hot chilli peppers, and we were somewhat concerned at our ability to manage to actually eat them. I could certainly imagine stories of people decomposing due to an overly hot curry - and I can recall one night when a group of us went for a curry a friend of mine had a particularly hot one, and as a result several hours later he had to telephone NHS Direct because he thought he was going to die from it. As it turned out we were delighted when we tried the ghost chilli burgers that rather than just being a battle to eat, they were actually really tasty burgers. Very hot and spicy obviously, not the sort of thing you'd plough through in a couple of bites, but if you took your time with it it was really nice and I must admit if there had been another two or three on the go I wouldn't have been against taking another one on. The butcher did advise us to marinade them in the hottest sauce that we could lay our hands on, cook them and then challenge people to eat two of them and then sit for five minutes without having a drink. Perhaps we'll do that next time! 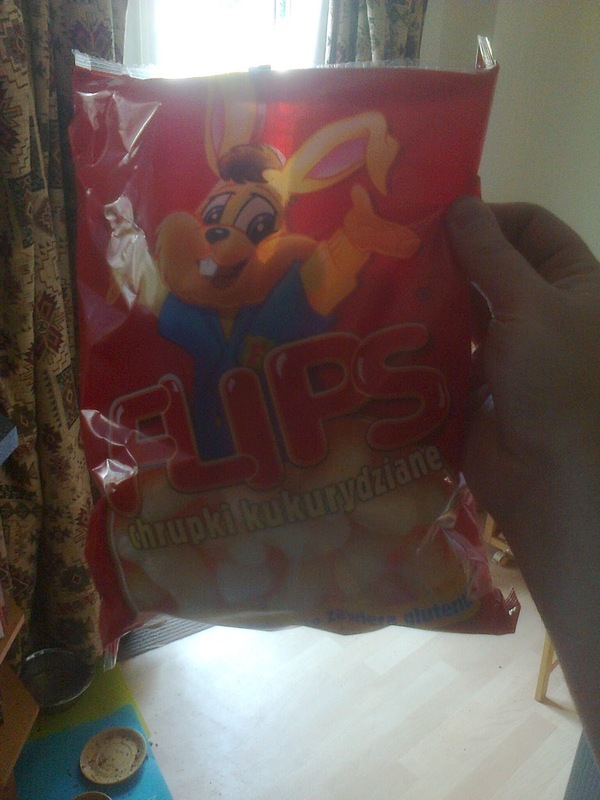 Dusty also picked up in Tesco a bag of what appear to be a Polish version of Wotsits. They're basically massive wotsits, but without any flavouring. Dusty did say at one point "They're really nice dipped in something!" - yes, they would be nice perhaps if they were dipped in cheese powder. Like they do with Wotsits! Unfortunately that's pretty much all of my news from Norfolk - I had a great time, except for when I had to go for a lay down after drinking a glass of water - yes, apparently the beer was fine, but I couldn't handle water. Life is strange. After my bad experience with the water I bought some cider to be on the safe side.